I visited the National Memorial for Peace and Justice for the first time last week. 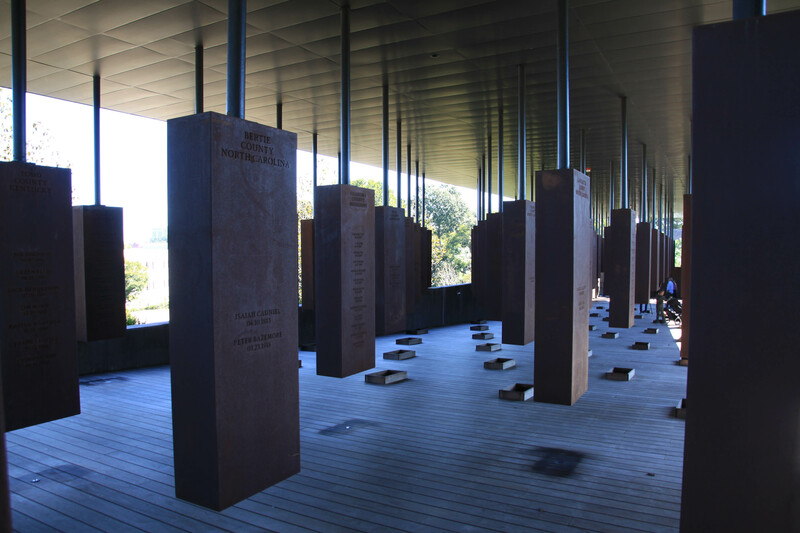 Located in Montgomery, Alabama, and memorializing victims of racial terror lynchings in the United States, its very name suggests its novel character and moving mission. Its form evokes deep experiences of both remembrance and empowerment. National Memorial for Peace and Justice, view from the North, October 18, 2018. Designed by MASS Design Group for the Equal Justice Institute. Generally our memorials bare the names of past events or persons as in the Lincoln Memorial or the Vietnam Veterans Memorial. Sometimes they are simply known by their location as in the Oklahoma City National Memorial. The reality they remember is seemingly is too hard to name. Occasionally, the preposition “to” is used. 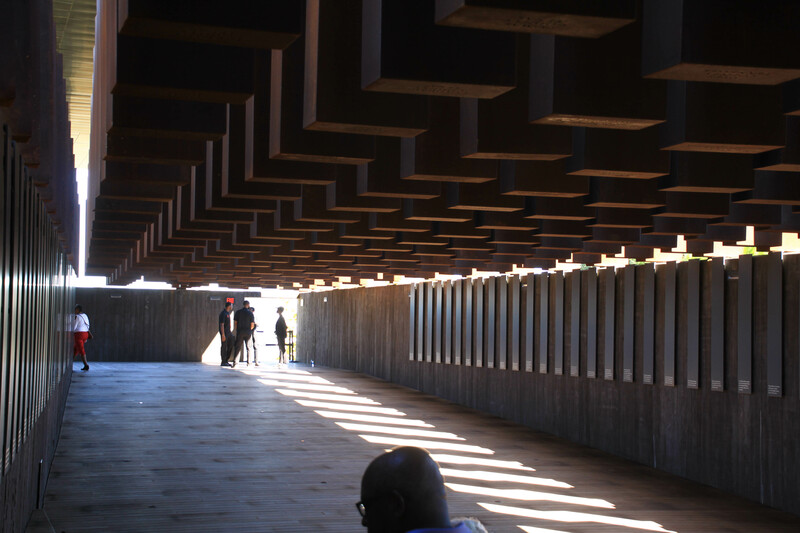 The names of Memorial to the Murdered Jews of Europe or the Memorial to the Enslaved Laborers at the University of Virginia suggest that they are in some sense an offering, in these cases an offering of reparation. When the word “memorial” is connected with a present reality, however, the word “to” can cause problems. 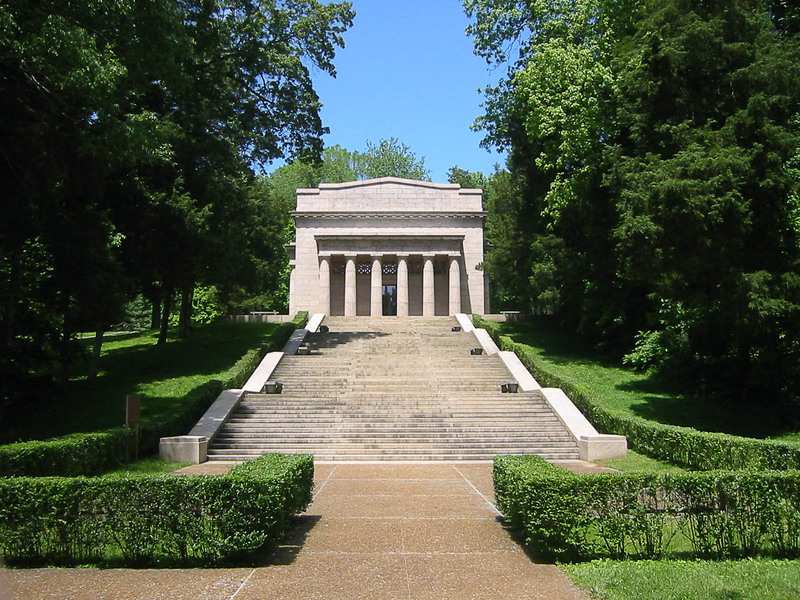 Thus was in 1964 when President Johnson suggested at the National Prayer Breakfast that a “memorial to God” be built in Washington, D.C. Johnson intended it as a physical extension of the piety that had brought the phrase “under God” into the Pledge of Allegiance a decade earlier and that had enabled Martin Luther King to link God and American freedom in his speech at the Lincoln Memorial six months earlier. But “memorial to God” was a “semantic blunder.” It was wrong, a Methodist editor explained because it “speaks of God in the past tense” (New York Times, March 15, 1964). The idea was quickly abandoned. 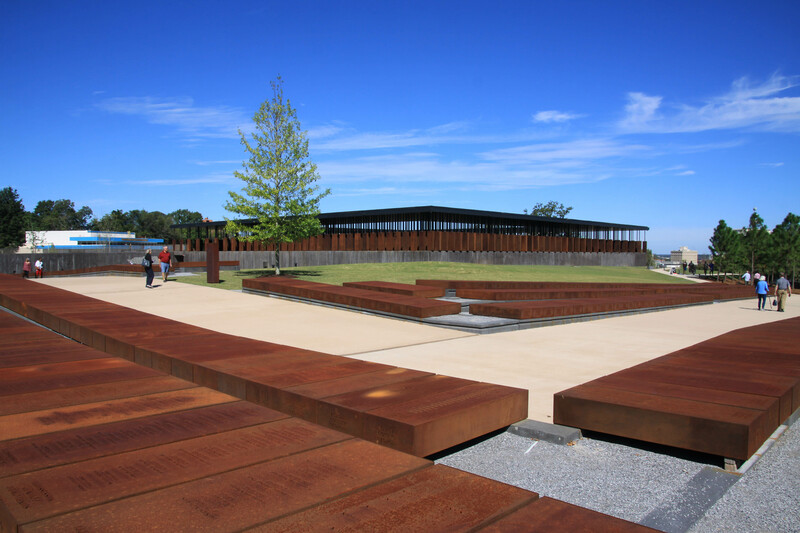 While many headlines announcing the Montgomery memorial’s opening in April 2018 referred to it as “a lynching memorial,” Bryan Stevenson and the other developers of the memorial did not choose this name. Many memorials are silent as to the proper response to the events they recall. Their purpose is to remember, sometimes to celebrate. They expose a tragedy or extol a hero, but the response they desire is less clear. One thinks in this respect of the simple list of names on the Vietnam Veterans Memorial, or even the more heroic arches and wreaths of the World War II Memorial. In contrast this is a memorial is unambiguous about its purpose to encourage peace and justice. Visitors encounter it through a clear processional path that leads them both around and through all sides of the square, colonnaded, hilltop temple. 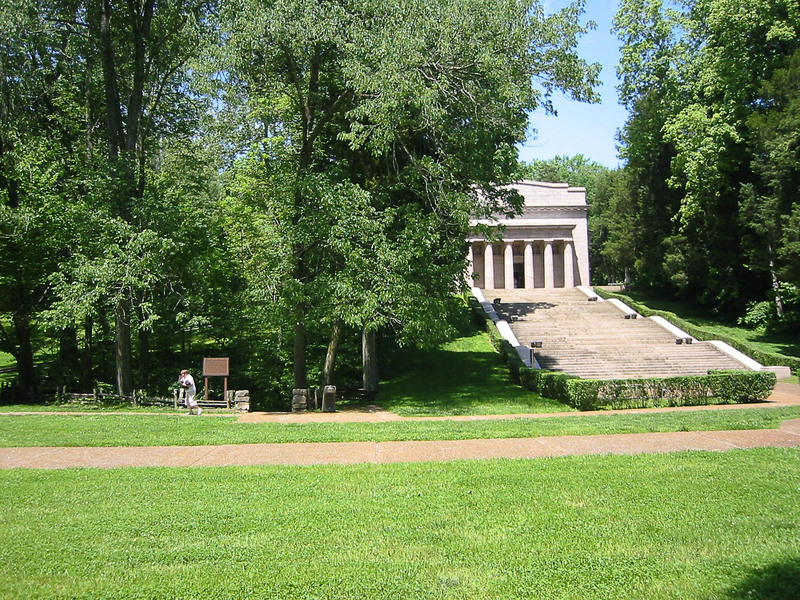 While the memorial looks like a place to go it, it is actually a path to walk. 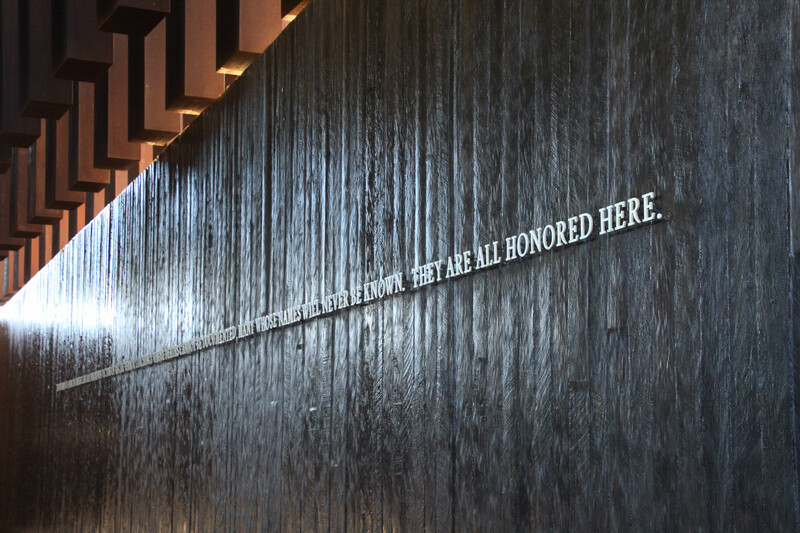 In this respect, the memorial is more like an interpretive museum than a static monument. Walking south along the memorial’s west side, visitors read signs that explain the development of the story from slavery, through emancipation and reconstruction, to segregation enforced by the racial terror of lynching, to the present day when African Americans are “overrepresented in prisons and jails and underrepresented in decision-making roles in the criminal justice system.” A statuary group by Kwame Akoto-Bamfo vividly depicts the horror of family separation and enslaved person’s defiant humanity. 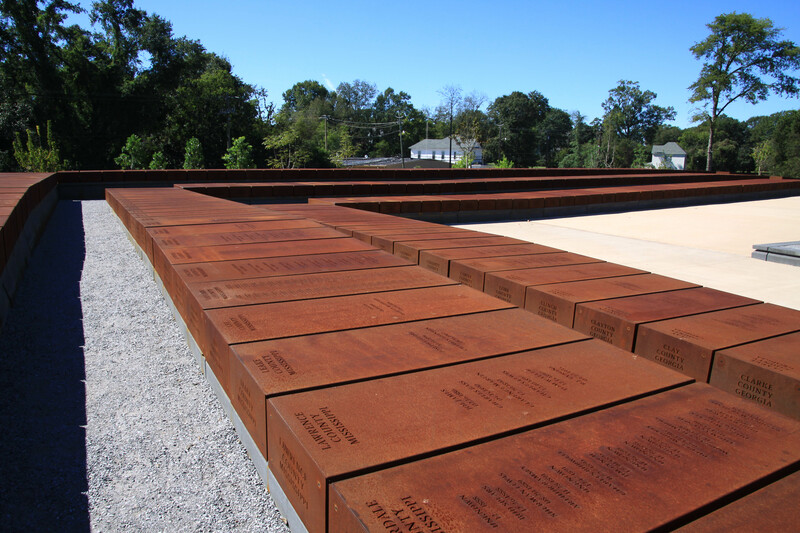 Then, instructed that the memorial’s purpose is to “inspire individuals, communities, and this nation to claim our difficulty history and commit to a just a peaceful future,” visitors reverse their steps, to ascend to the memorial itself and walk clockwise with the sun where rust-covered corten steel boxes present the visitor with the names of counties and those lynched in them. 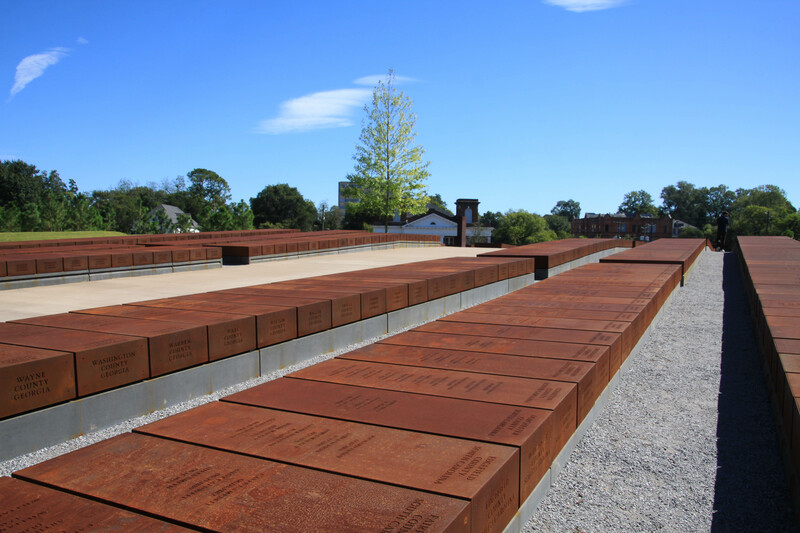 Many other writers have described how the rows of memorial boxes, each about as tall as a man transition from a forest of columns through which one walks to symbols of hanging corpses above one’s head as one descends the slope on the memorial square’s northern side. It is a moving and overwhelming experience. I was struck by the architects’ incorporation of the archetypal experiences of mountain and cave. 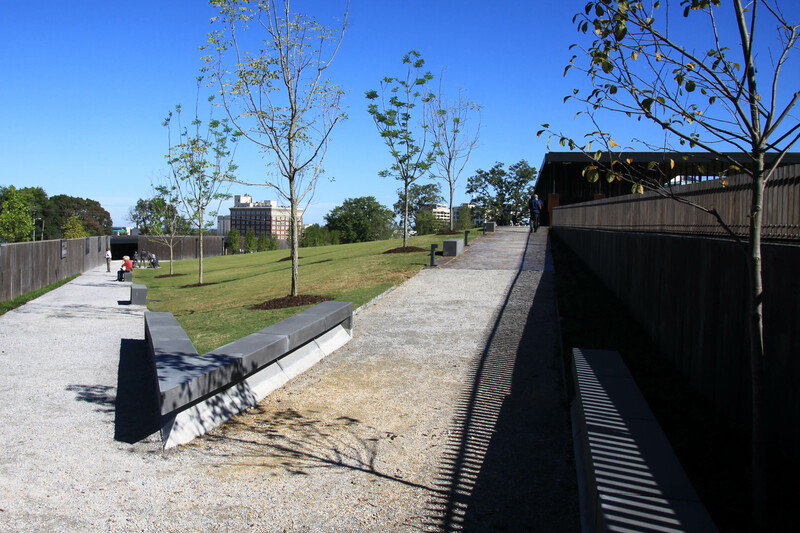 Ascending the hill, visitors are bathed in the breeze and the sun or the wind and the rain and look down on the valley of the Alabama River and downtown Montgomery. The dome of the State Capitol is just visible between other buildings. But then they descend into the shaded third and fourth sides of the memorial square. 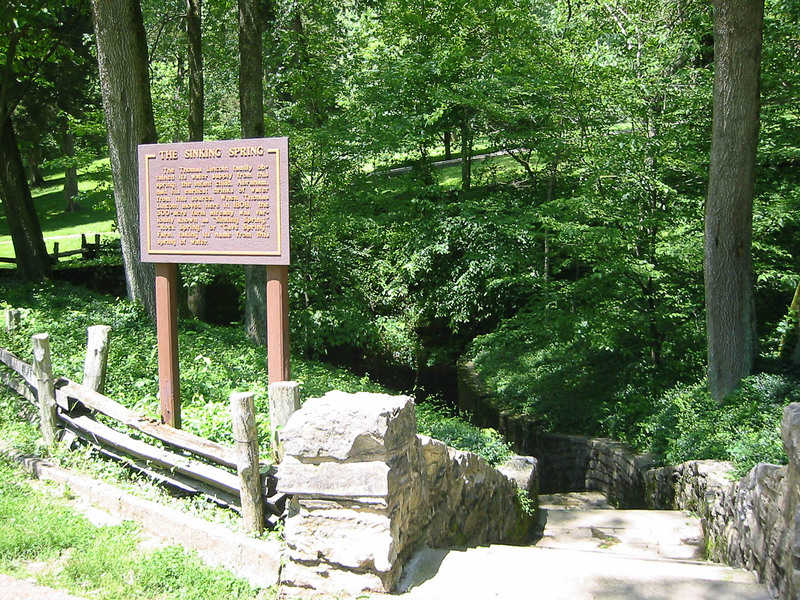 There the path proceeds below memorials that loom above and along brief summaries of individual stories, to a memorial wall covered with flowing water. This cooler, shadowed section provides some comfort, reassurance and shelter from the weather. 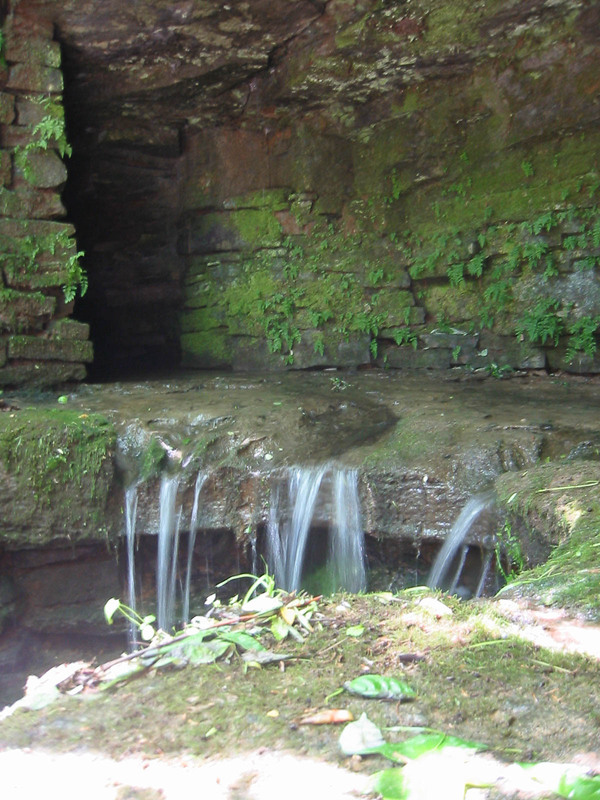 The flow of the water down the wall only to disappear beneath the floor reminded me of a sinking spring in a cave. 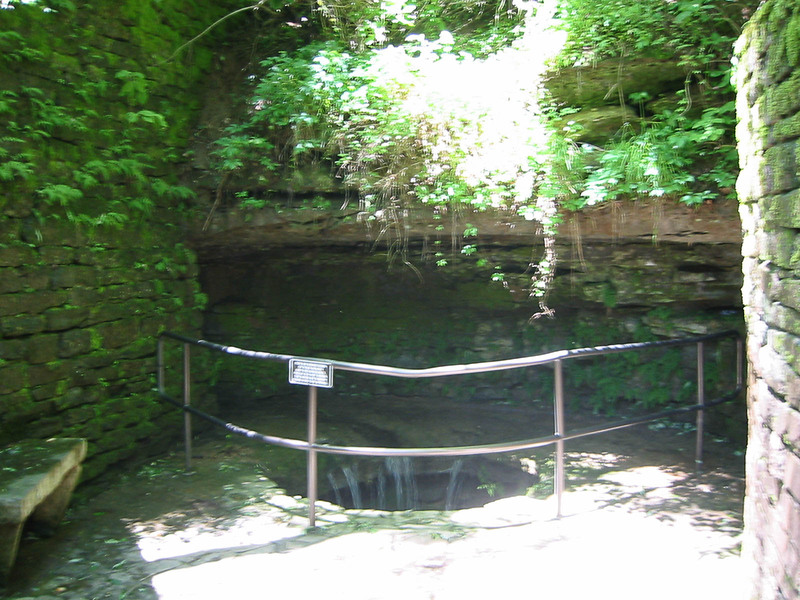 In particular I thought of Abraham Lincoln’s birthplace where John Russell Pope’s hilltop temple sheltering the log cabin sits above the steps that descend into the cave with the spring that provided water for the Lincolns. 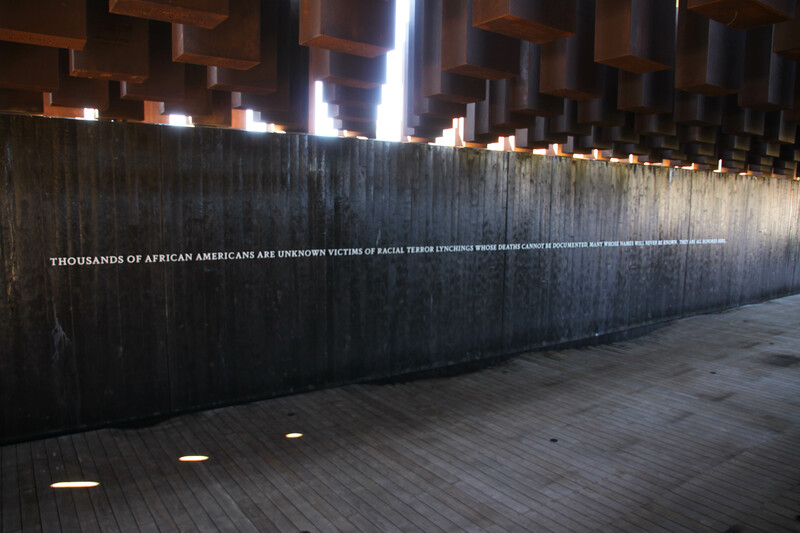 With a drinking fountain and an exhortation to love, defiance, and self-respect from Toni Morrison visitors exit the cave and the memorial square into the southern sky over an unshaded field. Here the struggle for peace and justice resumes. Visitors again reverse themselves to walk counter-clockwise through duplicates of the memorials that hang inside. They are waiting to be reclaimed by counties across the nation that make plans to remember racial terror in their landscape. The future placement of these boxes in locations across the nation will extend the memorial’s presence and help it remake the story told by the built landscape of the south as its planners propose. Earning the right to reclaim the box requires tangible efforts toward peace and justice. Thus immediately upon leaving the memorial square, visitors have something to do. It will be interesting to see how the absence of some boxes and the presence of others is interpreted by the memorials architects and visitors in the future. For now, with a church wonderfully named the Old Ship of Zion standing outside the fence, the field feels like a graveyard. To exit the memorial visitors continue counter-clockwise along three sides of the square. Once again they overlook the city with its towers of finance and government and a historic house of worship in the foreground. A statue of individuals sticking their hands up out of a block of concrete provides a final suggestion of the contemporary needs for peace and justice. 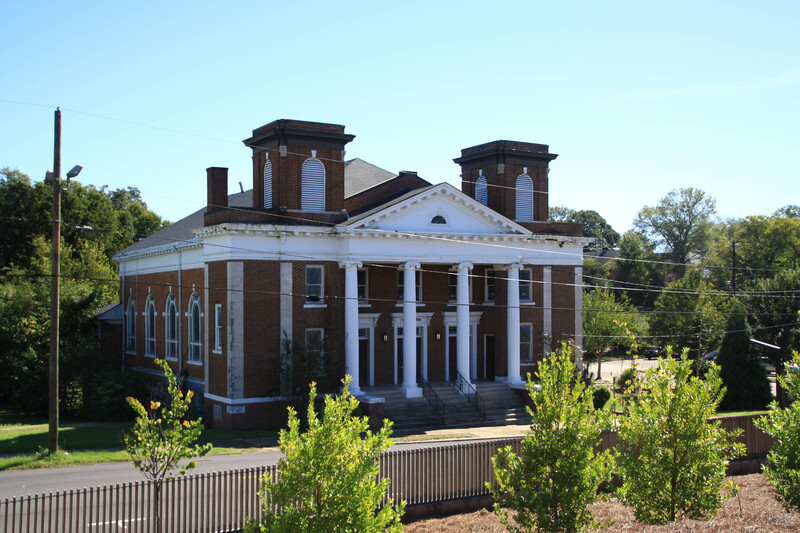 Church of Christ on Catoma Street built as a synagogue for Kahl Montgomery in 1862 and Renasant Bank Tower built in 1907, re-clad in 1978, as viewed from the grounds of the National Memorial for Peace and Justice. The spiral from the hillside out into the city for action reminded me of the concluding stanzas of a hymn for social justice written during the height of racial terror. shall come the city of our God. On Sunday at 10 a.m., St. Matthew’s Cathedral in Washington, D.C. will host its annual Red Mass. This Roman Catholic service is a votive mass of the Holy Spirit for members of the judiciary and the legal profession. It takes its name from the red vestments worn by clergy for masses of the Holy Spirit. One has been held in Washington annually since 1939, but both its place and its timing has changed. The president of the United States does not usually attend the service. But on Sunday, October 2, 2005, President George W. Bush attended with the newly confirmed chief justice, John Roberts. Since Judge Brett Kavanaugh is both a practicing Catholic and a member of the Washington judiciary, I expected he has attended many times. If the Senate had already confirmed him, I’d expected to see President Trump joining him at the cathedral to celebrate his confirmation. This would have been the third D.C. church Trump had visited for services as president. (The other two are St. John’s Episcopal Church and Washington National Cathedral.) As it is, it is doubtful that the president will attend. The Red Mass tradition dates to the middle ages but was first brought to the United States only in 1928 with a liturgy held at St. Andrew’s Church in New York City. The Washington tradition began in January 1939 at the National Shrine of the Immaculate Conception on the campus of the Catholic University of America. As Thomas Tweed explains in America’s Church, the dean of the university’s law school organized the liturgy in conjunction with the beginning of the new congressional term. The honored guests were members of congress and the executive branch more than they were members of the judiciary. Harry Truman attended when he was a senator and again as vice president in 1945. The liturgy was moved from the National Shrine to St. Matthew’s Cathedral at the beginning of the beginning of the Eisenhower administration in 1953. At the time, the shrine consisted of only the crypt church, while St. Matthew’s had long been a completed building and became the cathedral of the newly created Archdiocese of Washington in 1940. It was located several blocks from the White House, around the corner from the National Presbyterian Church which President Eisenhower attended on the morning of his inauguration and in which he was baptized on February 1, 1953. The first Red Mass at St. Matthew’s was organized by the John Carroll Society and held two weeks later, on February 15. Eisenhower attended the service the following year. The liturgy continued to be held in January or February another two decades. On January 26, 1975, President Gerald Ford attended and heard a sermon strongly objecting to the legalization of abortion by the supreme court a year earlier. The drama of the situation generated some controversy and subsequently the service was moved to its present position on the Sunday prior to the opening of the supreme court’s new term on the first Monday in October. The opening of judicial terms has been the customary time of the liturgy for centuries. The Washington service’s move to that date, however, is linked to the Catholic church’s objection to Roe v. Wade. If a world civil religion with the United Nations as a focus were to develop, one of its sacred sites would surely be San Francisco, the UN’s birthplace. The UN already figures prominently in the iconography of one of the city’s sacred shrines, Grace Cathedral. Entering this Episcopal cathedral by its main doors, one of the first things that draws a person’s attention is a mural commemorating the UN’s founding. Just to the left of the mural a metal casting makes the UN’s religious significance more explicit. Potentially sacred verses of a global civil religion ring the UN emblem symbols of Islam, Judaism, Buddhism, Christianity, Confucianism, Daoism, and Hinduism are arranged below. Venturing further into the cathedral, careful observers may also see the UN symbol shining like a silver moon in a clerestory window honoring President Harry S. Truman. It is not surprising that the United Nations should be so celebrated in the city of its birth in a mainline Protestant church. As Heather Warren showed in Theologians of a New World Order, Protestant ecumenists were instrumental in its founding. Yet, I can recall only one church in which I have seen the United Nations flag displayed in honor, St. Luke’s Episcopal in Atlanta, Georgia. Grace’s sister Episcopal cathedrals in Washington and New York are among the many Protestant churches of the twentieth-century with expansive iconographic schemes celebrating the unity of humanity. Yet, as far as I recall, neither of them give a prominent role to the United Nations. A world civil religion, especially one in which the United Nations plays a central role, seems to be something we are only able to explore in fiction. In the 1982 movie The Wrath of Khan, the Star Trek franchise introduced the UN-inspired emblem for the United Federation of Planets for the first time. It was a ritual redolent with civil religious meaning, the funeral of one who had given his life for his friends, Commander Spock. Since then the Federation and its emblem and have been treated with more religious-like ceremony in Star Trek shows and films. The idea that the United Federation of Planets is the future fulfillment of both the United States and the United Nations is evident throughout the Star Trek franchise. Here perhaps we can see an image of the global civil religion Bellah imagined. Transfiguration in Lent or before Lent?